In response to the slaughter of some 100 sled dogs in Whistler, BC, killed because they were not cost-effective after the 2010 Winter Olympics, activists want the sled rides to stop. The incident came to light recently when WorkSafeBC filed a report of an employee of Outdoor Adventures Whistler who requested and received compensation for post-traumatic distress disorder after killing the dogs. "I don't think society is willing to accept that animals, particularly dogs, should be killed just because they are surplus or don't suit the purpose they were born for," said Debra Probert, executive director of the Vancouver Humane Society, which has called for a provincial ban on tour businesses, reports the Associated Press. Horrific details in the report include the worker describing having to shoot dogs multiple times because he did not kill them with the first shot, as well as using a knife to slit the throats of some dogs when his shots were not accurate or he ran out of ammunition. But some dog sled business owners think an outright ban is too harsh. 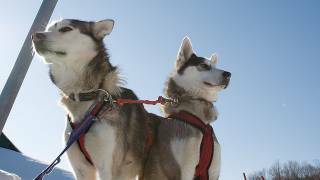 Musher Karen Ramstead, owner of North Wapiti Siberian Husky Kennels in Perryvale, Alberta, Canada, says to call for a ban is "gross overreaction," reports the news source. "I am horrified by what happened in Whistler. That is not acceptable to me as an individual or to the organization. But to paint an entire sport with the sins of one individual is irresponsible as far as I am concerned." The organization People for the Ethical Treatment of Animals is staunchly against dog sledding. "Sadly, this is not an isolated incident," spokeswoman Michelle Sherrow says. "Mushers routinely abandon, shoot, bludgeon, or drown dogs when they become ill, don't run fast enough, or are simply unwanted." But Paul and Sue Schurke, who have owned Wintergreen Dog Sled Lodge in Ely, Minn., for 30 years, disagree. "What happened in B.C. is such a shocking anomaly, I've never heard the likes of it. The magnitude of this atrocity is so shocking - all of us, our heads are reeling. I'm not aware of anyone in the recreational mushing industry who makes a habit of culling," says Paul Schurke to the AP. Colossal Winter Storm Roars Across U.S.